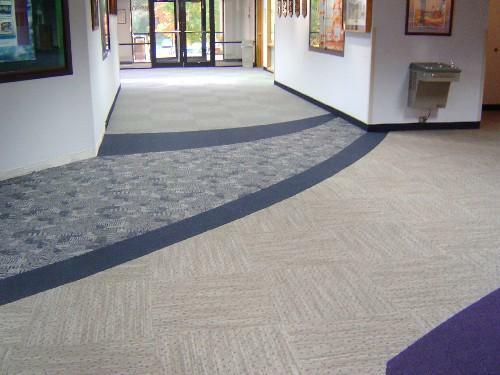 Maintaining clean carpet is crucial to the overall appearance of your office. Our professional commercial cleaners can develop a detailed, industry approved plan that suits your needs. All of our commercial carpet cleaning plans will improve the look of your carpet and our technicians make sure to remove all spots that are able to be removed. Maintenance Carpet Cleaning is ongoing, consistent cleaning, designed to prolong commercial carpet life and appearance. We use cleaning methods that adhere to the warranty specs (if applicable). Maintenance Management keeps your carpets looking good all the time. Restorative Carpet Cleaning is deep cleaning and pile lifting, designed to restore older or more heavily traveled carpet to an acceptable appearance level. Dry Carpet Cleaning methods uses a slightly moist powder and heavy-duty pile lifter/vacuum to penetrate the carpet fibers and leave your carpet dry when we leave. Low Moisture Cleaning involves lightly misting our cleaning products over your carpet and running over the fibers with a commercial grade pile lifter. The carpet is dry by the time we’re walking out the door. Spot Removal Cleaning uses a rotary machine with a cloth bonnet that creates enough friction to remove almost any stain while lightening the carpet and releasing a minimal amount of moisture. Steam generated from stea cleaners by the help of very hot tap water are used for cleaning. This is not a method in which you have to invest a huge amount of money or chemicals. Scientific and clinical research has proved that steam kills germs, bacteria, dust mites and it is more effective than any toxic or harsh chemicals. For allergic people, steam cleaning is very useful because it does not contain any kind of chemicals that can affect the person. It also cleans or kills all the allergens that are present in the atmosphere.